If you want to help ADHD, you must address any issues caused by diet or nutritional deficiencies. 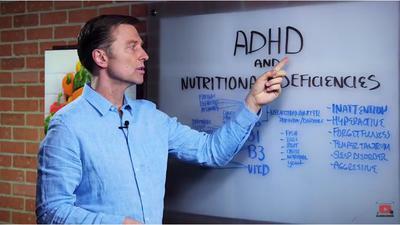 In this video, Dr Eric Berg talks about some of the deficiencies people with ADHD suffer from and some foods that can help. There may be some digestive issues that can cause the deficiencies as well even if the correct foods are consumed. Keep that in mind. He says this is mainly a low vitamin B and vitamin D deficiency. These 2 vitamins mostly affect the cognitive function. A deficiency in vitamin B12 causes anxiousness (not being able to sit still), mood issues, sleep issues, and have memory problems. Vitamin B6 helps with concentration and calming the nerves. Someone deficient in this will be hyper and have problems concentrating. Vitamin B1 mainly controls blood sugars which is a huge issue for ADHD. Most people today eat way to much sugar/carbs and people with ADHD can't handle them. Being deficient in B1 causes a lot of stress to build up, mind racing, irritability, and restlessness. Deficiency in B3 causes memory issues and depression. Being deficient in vitamin D can cause depression, memory issues and possibly rage. These are just some of the possible deficiencies that can exist. There also can be mineral deficiencies as well as protein. There can be other issues like heavy/light metal toxicity. What can I do? Diet (what we eat and drink everyday) is one of the most important factors. If you child suffers from consuming carbs/sugar and you remove this and add in vegetables, good fats, and proteins, you can see immediate changes. Parents have told me personally that following this has created immediate improvements in their child. Some of the foods being consumed are removing the vitamins mentioned above from your child's body. Refined carbohydrates not only cause blood sugar issues but the depleting of vital vitamins and other nutrients. If your child has any food allergies, you don't want to give it to them. For example, if they can't have dairy, then don't give them cheese. You will have to work on transitioning your child to eating healthy. It might be easy, it might be a lot of work. It is required though. It doesn't mean you have to give up all foods that are currently being eaten. I'm going to provide a video and a link below to recipes where you can make some of the same foods but they are healthier and eliminate the issues mentioned above. This video below is the introductory video. In the description on youtube is all the links to the recipes of low carb foods that you can make. If you want to learn more about helping ADHD naturally, make sure to sign up on my email list. Hello. This isn't Dr Berg's site but I follow his teachings. From my memory, He doesn't recommend alkaline water. I can't find the video I watched about this talk a while ago.